Rights Issues and Open Offers involve shares being offered to existing shareholders at a price, to raise funds for the company. The need for extra cash may be to fund a take-over, acquire assets, repay debt or possibly even save the company from bankruptcy. Unlike the other issues discussed, a Rights Issue or Open Offer cause significant change to the company's cash flow and shareholders have an investment decision to make as to whether or not they want to take up the Rights Issue or Open Offer. As such a rights issue requires the publication of what is, in effect, a prospectus, setting out the financial effect of the issue and the reasons for raising funds. A Rights Issue and Open Offer are used by companies to raise capital by selling shares, however with an Open Offer you cannot offer to sell the right to buy the shares to anyone else, whereas with a Rights Issue you can. Another key difference between a Rights Issue and an Open Offer is the Open Offers often enable you to purchase additional shares over and above your entitlement i.e. an Excess Application. The number of ordinary shares in issue increases by 25% and the net asset value (NAV) per share alters to reflect the amount of cash raised. The company will try to maintain dividends on the increased share capital as its additional resources should generate additional profit. The company issues allotment letters to shareholders setting out the details of the new share issue and informing them of the number of shares to which they are entitled and the cost. If the shareholder wishes to take up all or part of the rights issue they will accept the allotment by paying for the shares. Payment is generally due within four weeks of the announcement of the issue. Because the letter of allotment usually allows the holder to buy shares at below the current market price, it has a value - called the "premium" or "nil-paid price". Allotment letters are "renouncable" documents - which means investors are able to trade their right to buy the new issue shares on the market, the shares are referred to as trading "nil paid" until the right is excercised. In our example you would expect the nil paid price to be approx: 190p - 150p (the full paid ex-rights price less the amount that must be paid to take up the rights issue) = 40p. The nil paid price, referred to as the 'premium', has an option element in it. 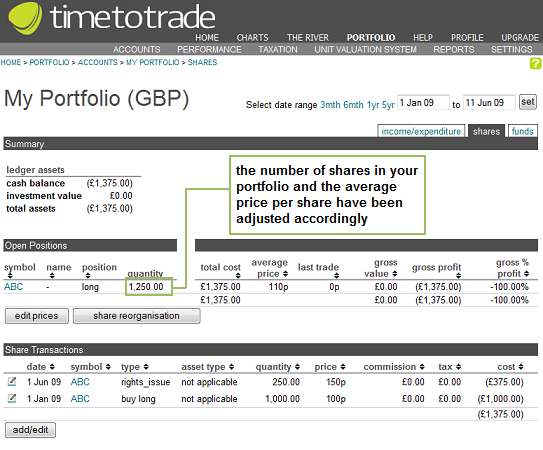 For 40p investors can control, for up to one month, shares worth 190p, which represents a gearing of 4.75 (190/40). This sometimes results in a high volume of dealing in the nil paid shares. The owner of the nil paid shares can decide to exercise the right to purchase, in which case they must then pay the full rights issue price (in this case 150p) for the shares they have been given the right to buy. Note: in our example, the nil-paid market price would normally be less than 40p but could be more, depending on the market's reaction to the rights issue and the publicity surrounding the company's prospects. If the shareholder does not accept the letter of allotment or sell their rights nil paid within the allotment period, then the shareholder loses their rights. Open Offers are a variation of rights issues and are made to existing shareholders to subscribe for securities in proportion to their shareholdings. They are not, however allotted on a renounceable document, so they are not traded on the market except when they are fully listed. Open offers frequently accompany rights issues and give shareholders the opportunity to subscribe for further shares. Let us look at the Capital Gains Tax implications of a Rights Issue or Open Offer. The rules differ depending on whether you decide to take up your Rights Issue or sell the rights nil paid. If you decide to take up the Rights Issue, it is treated as a "Share Reorganisation" by HMRC and the new shares are added to your existing holding, and are deemed to have been acquired at the same time and as your original share holding. Now let us consider the situation if you sold your nil paid rights instead. If you sell your entitlement to the Rights Issue to another investor, then HMRC require that any cash received from selling the nil paid Rights Issue be treated as a "Capital Distribution". The Capital Gains Tax treatment of the sale of the nil paid Rights Issue differs depending on the amount of cash received from the sale and whether it falls under the classification of "large cash" or "small cash". it is greater than 5% of the value of the shares at the date of the distribution. If the cash is classified as "small" then the cost of the original share holding is reduced by the cash amount and the tax liability is deferred until the shares are disposed of. On the other hand, if the cash is classified as "large cash", then there is deemed to have been a share disposal and as such there is an immediate tax liability. In such an instance, to calculate your tax liability it is necessary to allocate a cost to the cash received. The cost is apportioned to the cash received in proportion to: the value of the cash divided by the sum of the value of the cash plus the value of the associated shares, on the date the cash was received from selling the Rights Issue nil paid. First of all let us look at what happens when the cash is classified as a "small cash". ie total share value of 200p x 1000 shares = £2000. In order to determine the tax treatment of the sale proceeds, you firstly need to determine if the cash is classed as "large" or "small". In this instance the cash would be classed as small as it is less than £3,000. This means that the base cost of your shares is reduced by the amount of the distribution. We initially purchased 1000 x shares in ABC plc @ 100p giving total base cost of £1,000. Now let us consider a situation where the cash distribution is classed as "large". Using a similar example to previous, say we own 20,000 shares in ABC plc and instead of a 1:4 rights issue, we'll look at what happens with a 1:2 rights issue. ABC plc announce 1:2 rights issue @ 150p per share. For every two shares you own you are given the right to purchase one new share at a discounted price of 150p. Your existing holding is 20,000 shares, so you are able to purchase up to 10,000 new shares. 40p x 10,000 = £4,000. = 20,000 x 200p = £40,000. Firstly, we need to calculate if the money received from the sale of the nil paid rights is classed as a "small" or "large" cash distribution. In this instance, the distribution is classed as "large" as the cash received is greater than £3,000 and 5% of the market value of the shares. The market value of the shareholding in ABC plc is £40,000, and the cash received as a percentage = £4,000 x 100 / £40,000 = 10%, so the cash is treated as a disposal and incurs an immediate charge to capital gains tax. The timetotrade capital reorganisation wizard calculates if the cash received is large or small, apportions and adjusts cost as necessary and determines the appropriate tax treatment. We will look at two scenarios, using the examples above: the first where you take up your Rights Issue in full, the second where you sell the nil paid rights in return for a cash payment. Using the example above, we will assume you initially purchased 1000 shares in ABC plc on 1 Jan 2009 and that you decide to take up your full entitlement to the rights issue. To add the Rights Issue, click on the "share reorganisation " button as illustrated above. This will take you through to the Share Reorganisation page. Firstly select the date that the share reorganisation is deemed to occur. Note that HMRC specify that "a reorganisation involving the allotment of shares is deemed to take place on the date following the day on which the right to receive the allotment expires". In this example, we will say that the Rights Issue date is 1 June 2009. Next, from the drop down menu select the shareholding that is subject to the rights issue. 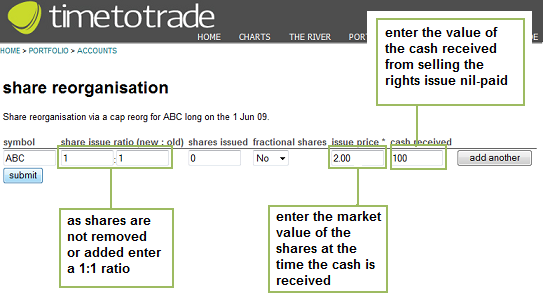 In this example, select "ABC"
Fractional Shares = no in this example no fractional shares were issued. Typically in the UK Fractional Shares are not issued, instead the company will usually sell any fractional entitlements on the shareholder's behalf and pay the proceeds to the shareholder as cash. If fractional shares are not received leave the default 'Fractional Shares' drop down menu at 'No' as in "No fractional shares were received". 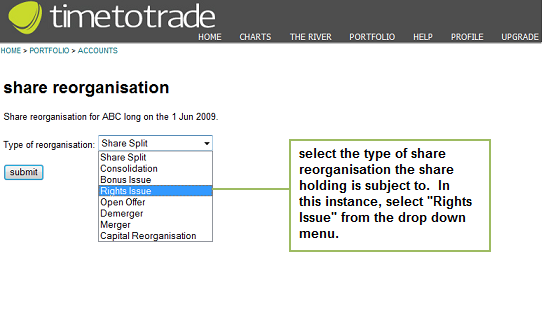 Alternatively if you did receive fractional shares, change the fractional shares drop down menu to 'Yes'. Issue Price = £1.50 When entering the price paid to take up the Rights Issue or Open Offer, please note that the value entered must be in GBP Pounds, Euro, Dollars etc and not in pence for UK stocks. Cash Received = leave blank. Check the details are correct, and click on the blue "click here to return to ledgers" to take you back to your share portfolio page. 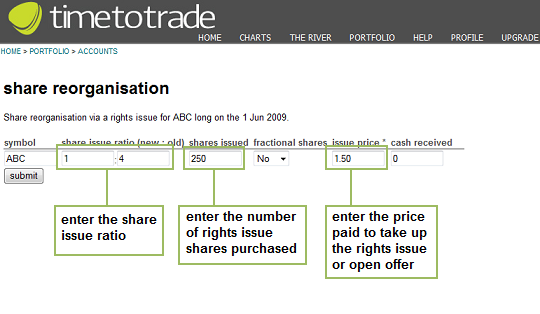 Returning to your share portfolio page you can see that the rights issue transaction has been added and that your "open positions" show you now own 1250 shares in ABC plc with an average purchase price of £1.10 per share, as expected. 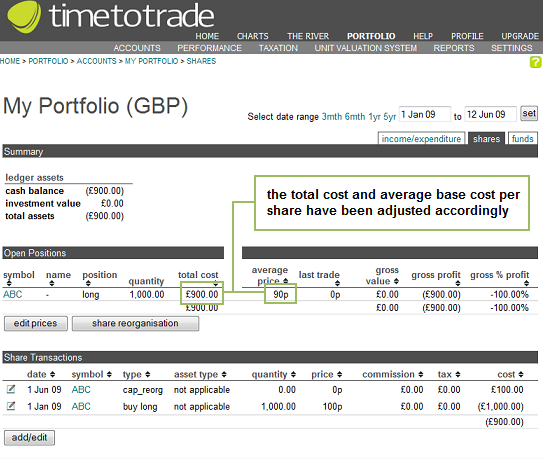 The rights issue has now been correctly accounted for within your timetotrade accounts. If you sell your Rights Issue to another investor i.e. you sell a 'nil paid' Rights Issue, then HMRC require that any cash received from selling the nil paid Rights Issue be treated as a "Capital Distribution". Note: when entering the sale of nil paid rights into timetotrade you must select reorganisation type "Capital Reorganisation" from the drop down menu - and NOT "Rights Issue". The timetotrade capital reorganisation wizard calculates if the cash received is large or small, apportions and adjusts cost as necessary and determines the appropriate tax treatment. 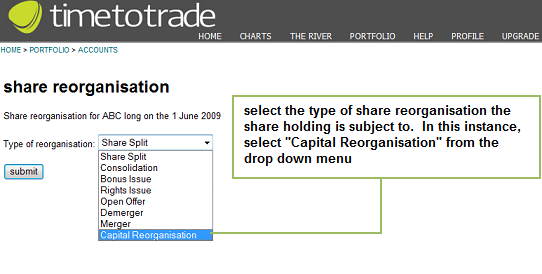 To enter the cash received from selling Rights Issues nil paid, firstly select the 'share reorganisation' wizard on the shares section of the ledger. Select the symbol associated with the Right Issues that you sold nil paid. As the number of shares you own is not impacted by the cash received enter a 1:1 share issue ratio. Enter the market price of the underlying shares on the date you received the cash from selling the Rights Issue nil paid. This is necessary in order to apportion cost should the cash received be deemed "large". In our example we will say the ABC shares were valued at £2.00 (200p) on the date the cash was received. The value should be input in GBP pounds (not pence), euro or dollar. When you have completed the fields, click the "submit" button. You will now see a summary of the details input. Check the details are correct, and click on the blue "click here to return to ledgers" to take you back to your share portfolio page. 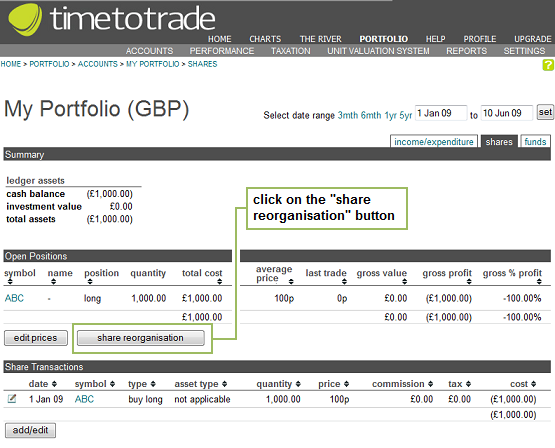 Returning to your share portfolio page you can see that the cash received has been been added to your transactions as a "capital reorganisation". The base cost of your shares has been reduced to reflect the cash received.